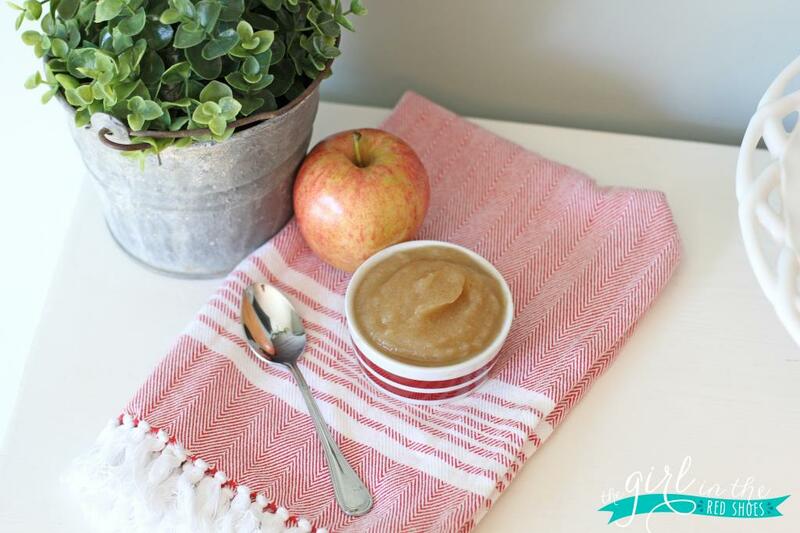 There is nothing quite like homemade applesauce….it’s been a favorite in our house for over a year now….and it’s SUPER easy to make! 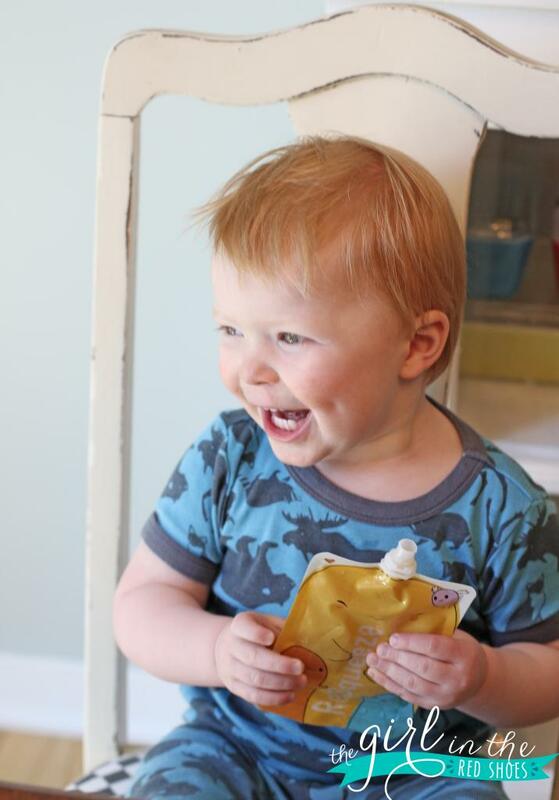 When Hudson started eating purees, I made 95% of his food…and I’m so glad I did. It was worth the effort (which really is minimal) in my opinion. And even though I don’t puree his food any more, I still make applesauce for him, because it’s his absolute favorite! 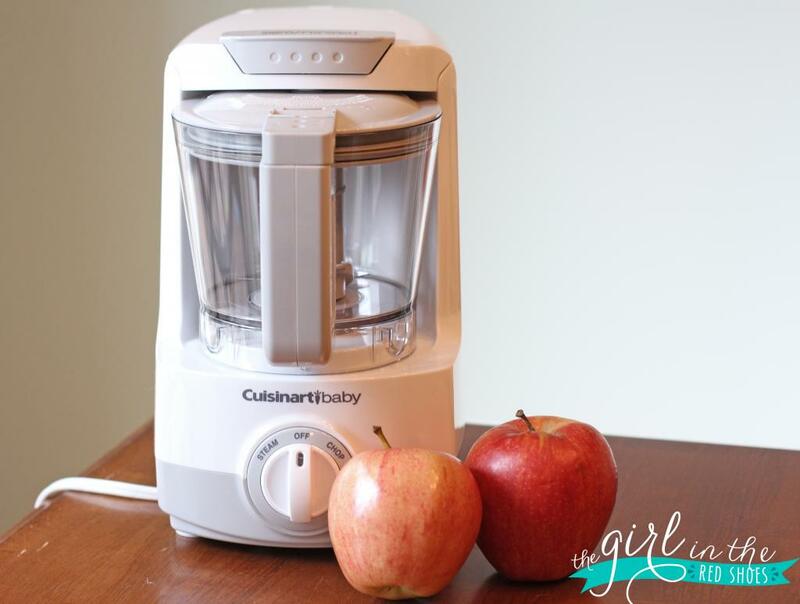 This time around I used the Cuisinart Baby Food Maker to steam and puree the apples…and it couldn’t have been easier! I really wish I had this when I was making Hudson’s food…it would have made everything 10 times easier. If you are thinking about making your own baby food I saw go for it! 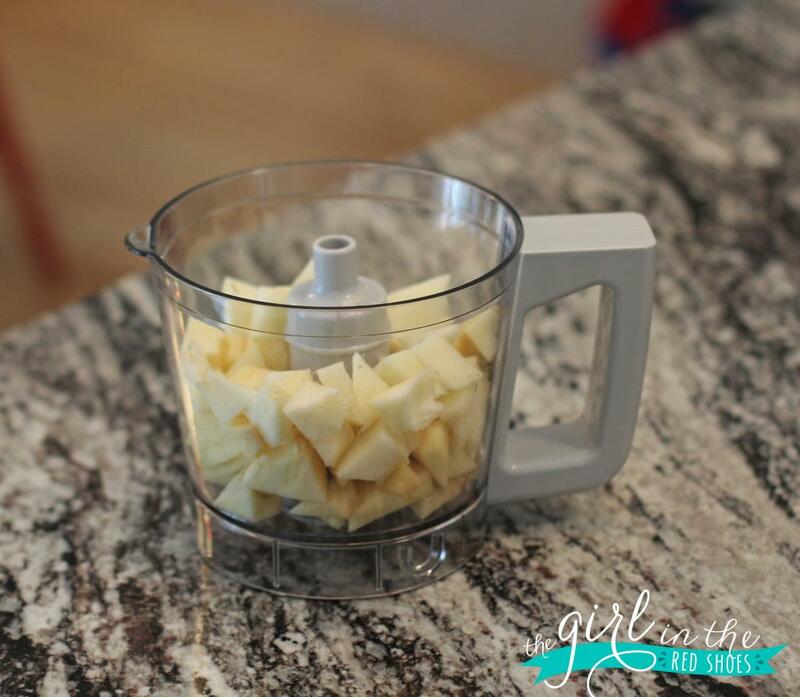 The time it takes is minimal and the Cuisinart makes it super simple. I used two organic apples, water, and a little bit of cinnamon for our applesauce. First, peal and chop two apples and add in water (the recipe book will tell you how much to add). And the Cuisinart Baby Food Maker did the rest. It steamed the apples for about 20 minutes and then I switched it to chop to puree it all. I added a few pinches of cinnamon and that was it! You can add a little sugar if you need to, but I’ve never had too…the apples are naturally sweet! The applesauce turns out so yummy every time! It’s a staple in our house for sure. And this little guy couldn’t wait to try it out! 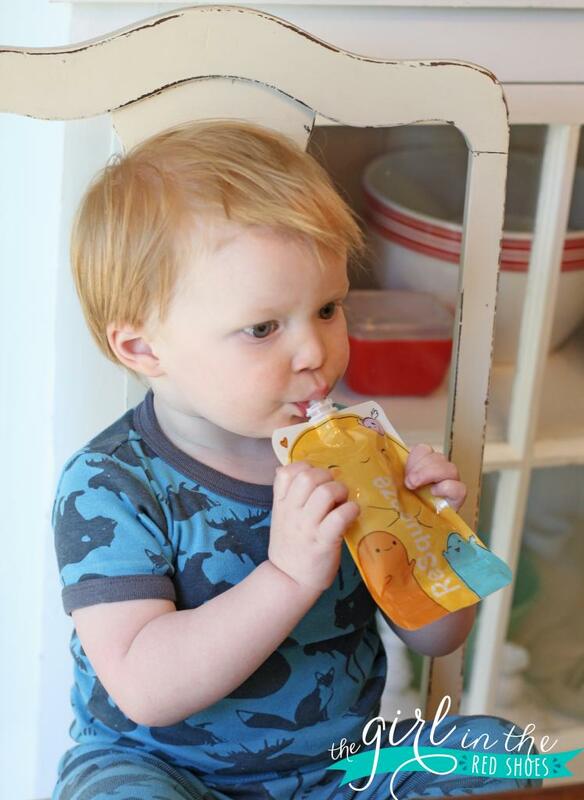 We use these reusable pouches and love them. See what I mean? Such a easy and healthy way to put a smile on my boy’s face! Love it! 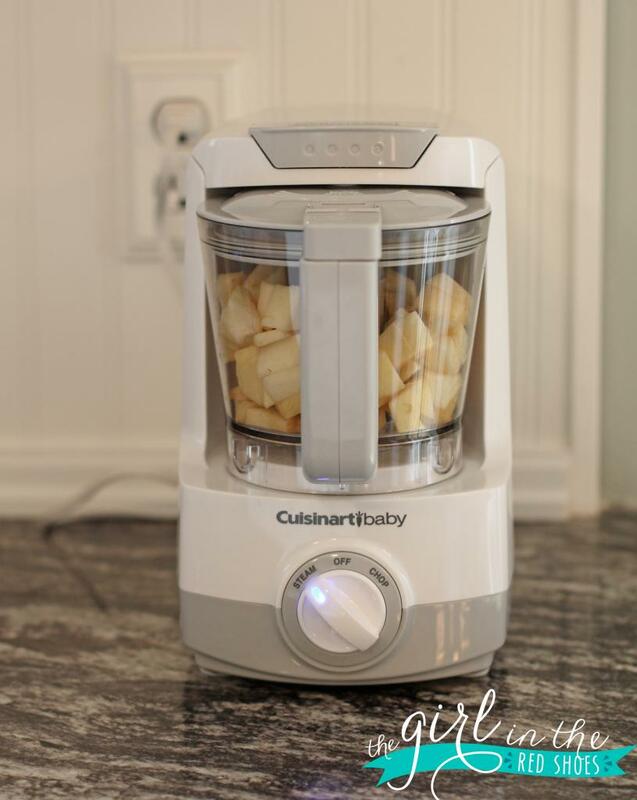 Cuisinart Baby Food Maker Giveaway! Want to win a Cuisinart Baby Food Maker of your own? All you have to do is visit the Cuisinart Baby Recipe page and come back here and leave a comment letting me know what you like about the Cuisinart Baby Food Maker and leave a link to your favorite recipe. When it comes to baby food it’s hard to stay on top of ingredients, consistencies and servings – getting the facts straight can be extremely confusing. This powerful machine steams, chops and purees your nutritious ingredients with ease making homemade baby food the gold standard for your baby. The generous 4-cup work bowl produces large batches of vegetables, meats and even fruits that you can freeze and store for convenient future use. Make baby food in 3 simple steps, first steam raw ingredients by using the integrated measuring cup to add the right amount of water. Next start by first chopping the ingredients then puree for quick and easy baby food with a perfectly smooth consistency every time! Many thanks to Cuisinart for sponsoring today’s story, and keeping Hudson healthy with quick, homemade meals! « Adventure is out there! I would LOVE to win this! We are starting proteins with little Charlotte and I can't make myself by the "meat sticks." I'm sure they are fine, but I wouldn't eat them haha! How awesome is this giveaway! I never thought I would want to make my own baby food, but my husband is all about it, so I thought why not try it out. This would make making baby food so easy! I would love to try out the Banana-Pear baby food or even just the applesauce like you did! This is the best giveaway yet! Thanks! I can't wait to try the Sweet Potato, Spinach and Chicken Dinner recipe. I love that you can steam and chop in 1 machine! I would make these teething sticks for my 1 yr old. I love that you can steam and blend all in one device! So much easier and way less to wash! 🙂 Thanks for the chance to win! So fun and SO easy! I bet that's some delicious applesauce! We are expecting our first baby any day now, and I am planning on making all of his or her baby food. The idea of one machine to do everything sounds amazing! The banana pear recipe sounds pretty delicious (http://www.cuisinart.com/baby/recipes/stage_1/277.html)! We are expecting our first and plan to make all purees! I loved the creative recipe for Brown Rice, zucchini and avocado. We always grow too much zucc in the summer and freeze it. I love that it is a 2-in-1! Makes for long term use through baby & toddler (which totally makes the investment worth it!) & it makes 1 less item to clutter your counter tops and cabinets! SO nice that it's a 2-in-1 machine. Looks compact enough for travel, too! I think the stage 2 broccoli and sweet potato recipe sounds great to try for my 7m old baby girl. Thanks for the opportunity to start making her food. Obviously thinking quite a few months ahead, but really glad I saw this (especially as an over planner)! I would LOVE to have/win this! When I was a baby all of my baby food was made by my mom in a blender. This seems much easier and more convenient while keeping the healthy mentality I have! The recipes were great and allow you to use the ingredients that you are already using for the grown up meal! My favorite recipe was the butternut squash recipe. These are not too expensive in organic form and easily found or even grown in Seattle! I think anyone who would be using it would appreciate the steam + chop option! One less thing to clean up! They've always been two of my favorite fruits so hopefully she'll love them too! I love that it steams! This recipe looks wonderful: http://www.cuisinart.com/baby/recipes/stage_3/9541.html. I would love to try this for my son! I love that it steams the food also. One step you can avoid on the stove top!!! I think Turner would LOVE this!!!! I love this it doesn't seem to take up much space on the counter! I bet the applesauce is delicious! Hudson seems to looove it! And PS his dimples are the cutest!! YUM. This makes me crave fall like crazyyy! I did not make food for my son but want to try it out for our little one that is on the way. Cuisinart is such a great brand that I would love to try this baby food maker. I would make the banana-apricot oatmeal. I would love to use this to make purees for baby #2! It's so nice that it also steams right in once place. The sweet potato, spinach & chicken dinner sounds perfect for my little girl who is about Hudson`s age! And i LOVE how simple and user friendly the dial is on the baby food maker… no need to complicate it! What an awesome giveaway!I made all my own baby food for my little guy who is now 20 months old. Although it was easy, I dirtied a lot of pots, pans, and the blender every time I made something new. I love that is an all in one appliance! I am not pregnant with #2 and would love to have this! His smile in that last photo is so sweet! And where are those adorable jammies from?! I love that it is a 2 in 1, and how easy it makes it. I loved all the recipes but would probably start with this one! The applesauce looks so good! Besides that one, I'd also want to try this because it's 3 of my favorite foods! We are just about at the stage of needing to make baby food again! Last time around we made all of it ourselves and it was always such a mess, between the pot and strainer and cover for steaming, the baby bullet and all it's parts. I'm interested in trying the Cuisinart since it's all in one!! 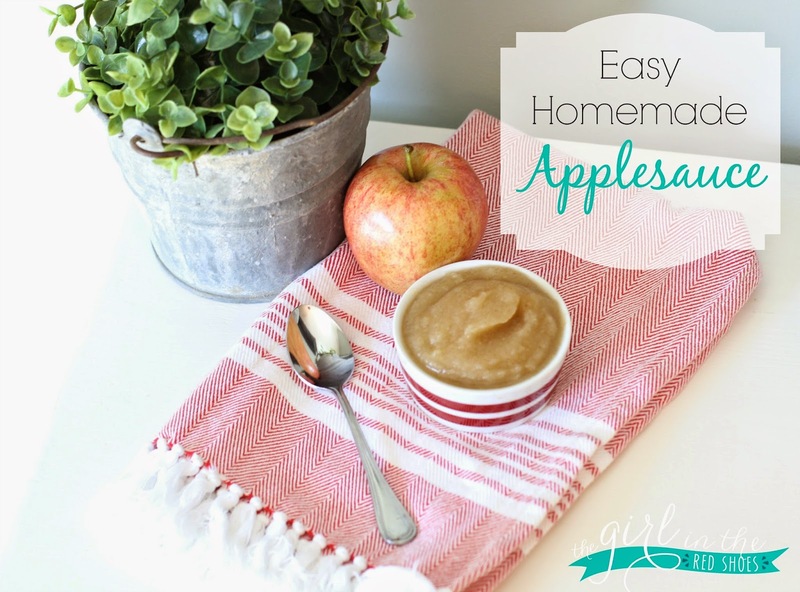 I love how simple and easy it seems to use and I'd love to make my own applesauce too. As for the recipes, the Sweet Potato, Spinach and Chicken Dinner looks great. I love that it is so compact and everything is all in one….and that I know exactly what is going into my baby's food! I love that this steams, chops, and purees all in one! So convenient!! I think my favorite recipe right now is the fruity yogurt breakfast, my daughter loves yogurt right now so this would be perfect! I would absolutely love this Cuisinart baby food maker, it would make my job of preparing a healthy meal for my daughter so much easier! Omg, I need this in my life! I have a 15 month old and I'm always struggling with coming up with meals for her. I love that this chops and steams, how awesome! This would be the perfect blessing for my little guy! What an efficient multitasker! I love the recipes too! My baby would love the fruity yoghurt breakfast! I love how easy it is! I currently use either my blender, which is hard to clean, or the pouches, which I don't kind but they are expensive. I would love to try this out!! I love that you can steam too with this! I already have a cuisinart food processor, but love the two step options. Love the idea of this recipe with oatmeal – http://www.cuisinart.com/baby/recipes/stage_2/285.html. I used our large Cusinart to make all of Avery's food, I would love a smaller one! What a great product and you can never go wrong with cuisinart. I enjoy reading your blog with such a real mama point of view. Loving the teething biscuits since baby boy is drooling and gnawing on everything these days. My husband and I are expecting our first this December, and this bad boy has been on my wish list for ages! I cannot wait to make my own baby food, especially http://www.cuisinart.com/baby/recipes/stage_1/275.html. I love that you can steam in it too!!! I loved making all of my first child's baby food, but this would make doing so for my second baby a lot easier! She's not even 2 months old yet, so we're a ways off from first foods, but this sounds delicious for the whole family! I have a 6 week old and I can't wait to make food for her! I love all fruit but look forward to this combination.